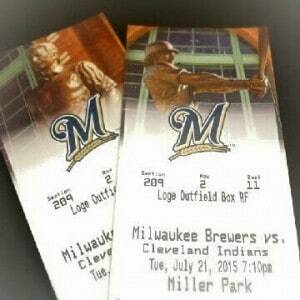 A chance to win these two Brewer tickets for July 21st. Please tell your friends! Do you have something that you have been meaning to get framed? Would you like a chance to win Brewer tickets (2) for Tuesday, July 21st at the same time? All you have to do is come in and place a regularly priced full custom framing order at Main Street Framing Gallery anytime between Wednesday, June 17th and Friday, July 17th and mention this post. You will be entered in the drawing for each piece you get framed. A randomly-selected winner will be chosen on July 18th and will be contacted by phone….and we’ll update everyone here as well. Please share this promotion with your friends!!!! Good luck to the Brew Crew, too!